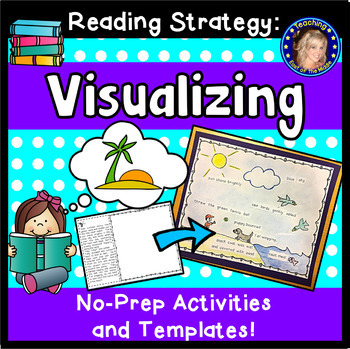 Teach and practice the reading strategy of Visualizing with these engaging cut-and-paste activities! All reading passages are included! No prep – just print! Visualizing while reading is a strategy that is fundamental to comprehension. 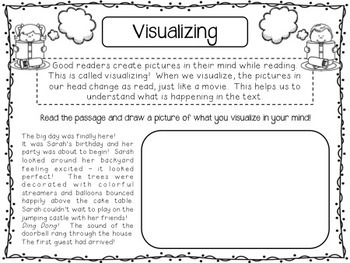 Visualization promotes active engagement with texts, encourages deep thinking and helps readers to retain information. Whilst this strategy comes naturally to some students, many children struggle to create mental images in their minds while reading and require explicit instruction and practice to develop these skills. Being intentional about practicing visualization has the power to transform students from passive to active readers! 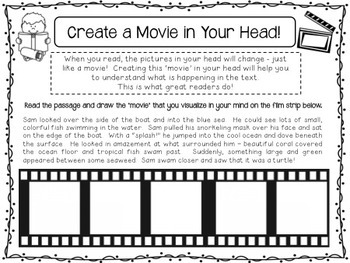 ♦ Introductory activities: Introduce your students to visualization and practice drawing a picture and ‘movie’ in response to short texts. A poster and discussion cards are included. 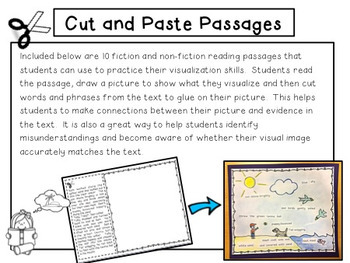 ♦ Cut and Paste activities: Within this section are ten short texts that can be used to practice visualization. Students read the text, and then draw a picture in the space provided to show what they see in their mind. Then, they demonstrate connections to the text by cutting and pasting words and phrases that match what they have drawn. This is a fantastic way for students to become self-aware of whether or not their visual image accurately matches the text. ♦ Templates: Visualization templates that can be used for any text. Please click on the Preview tab to see all the pages that you will receive in this resource! Are you looking for more reading strategy resources? Check out my new Context Clues resource by clicking here! If you have any questions, please do not hesitate to contact me via the Q&A Tab or email me at katie.walker1411@gmail.com. If you enjoy this product please don't forget to leave a positive rating and earn yourself TpT credits that can be used on future purchases! Thank you!